To form an alliance of concerned citizens, landowners, and public and private organizations to protect and improve the water quality and natural habitats in the Ulao Creek Watershed. The Ulao Creek Partnership, formed in 1995, is a well-established and focused alliance of concerned citizens, landowners, and public and private organizations dedicated to protecting and improving the water quality and natural habitats in the Ulao Creek Watershed of Ozaukee County. On May 19th - 2007, several Ulao Creek Partnership members participated in a Garlic Mustard Pull on the WE Energies properly located off of STH 32 and Ulao Parkway and Tom Latzl’s property adjacent to WE Energies in an effort to remove garlic mustard from this impressive woodlot. On Saturday, March 10, 2007, an intrepid group of people from the Ulao Creek Partnership hiked through the 'headwaters' of Ulao Creek. They brought their boots, chili, and a sense of adventure! The hike started at 9AM at Tim Kaul’s house ( 1669 Ulao Parkway South ). They hiked through the swamp discussing swamp features, concerns about the creek bed, stressed/dead trees, cattails, flora, invasive, wildlife, and Jill Hapner's vegetative work. After the hike, they returned to Tim’s house to warm up with some chili. Click on the pictures below to see more. A partnership of local landowners and county and state agencies hired the researchers to complete a plant inventory in the swamp as part of a restoration project for the Ulao Creek watershed in eastern Ozaukee County. The swamp protects the headwaters of the stream. An amphibian and reptile search, known as a herptile inventory, is part of an ongoing Ulao Creek restoration and management project. The local landowners, county and state agencies, and researchers participating in the partnership expect to prepare a watershed land-use plan in a few years. The reforestation of the Ulao Creek Swamp to native Tamarack and Cedar trees started in April of 1999. The swamp was once a forest, filled with trees adapted to wetland areas. In the early 1900's the swamp began to dry out and eventually was completely drained to allow for farming. Hardwoods took the place of its native trees. Now, the groundwater has naturally begun to shift, the swamp started to come back and the hardwoods are dying. 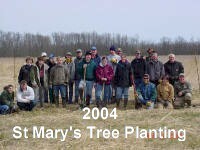 Nine hundred tamarack seedlings were purchased and on April 10, 1999 the UCP held its first tree planting. Five hundred Tamarack were planted on April 29, 2000 and on April 18, 2001 approximately 2000 trees were planted.